The Meadows are Todd Herfindal and Kevin Houlihan. Introduced years ago in San Francisco by future ex-girlfriends, the two have been making music together ever since. Todd and Kevin share lead vocal responsibilities. Using the tried and true foundation of drums, bass and electric guitars, The Meadows build upon their sound with vocal harmonies, acoustic guitars, piano, organ, strings, and everything else you can think of, to create a sound that is expansive and cinematic. The Meadows have delivered the follow up to their critically acclaimed self-titled debut LP. The result of their latest mental brainstorm is “First Nervous Breakdown”’, the band’s second full-length album, releasing January 29th, 2008. Key tracks on the record were mixed by Danny Saber (The Rolling Stones, David Bowie, U2, Willie Nelson, Sheryl Crow, INXS, Garbage, The Charlatans UK, Black Grape). 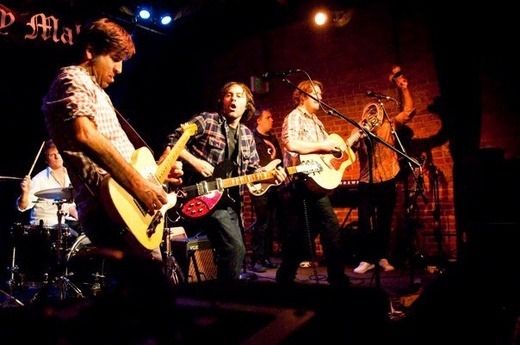 A colorful cast of players appear including Brian Young (Fountains Of Wayne, The Posies) on drums/percussion; Joe Skyward (Sunny Day Real Estate, Sky Cries Mary, The Posies) on Bass; Brian Lapin (Black Eyed Peas, Mozella, The Shore) on organ and Piano. Everything is gonna be o.k. Indie Pop Artists, Win A Year's Supply of Strings & Accessories! Reached 13th in Best of Rock chart in 2015. In the top 20 for 3 weeks. Reached 9th in Best of Rock chart in 2014. In the top 20 for 5 weeks. Reached 20th in Best of Rock chart in 2013. In the top 20 for 1 week. Reached 19th in Best of Pop chart in 2011. In the top 20 for 2 weeks. Reached 60th in Best of Country chart in 2016. In the top 100 for 1 week. Reached 55th in Best of Country chart in 2015. In the top 100 for 24 weeks. Reached 45th in Best of Country chart in 2014. In the top 100 for 17 weeks. Reached 45th in Best of Rock chart in 2011. In the top 100 for 13 weeks. Reached 31st in Best of Pop chart in 2011. In the top 100 for 11 weeks. Reached 36th in Best of Rock chart in 2011. In the top 100 for 8 weeks.